If you need an oil boiler service, look no further. With over 30 years successful trading our team of R.G.I. plumbers can service your oil boiler with ease. The last thing you want would be for your boiler to break down in the cold weather, this is why all boiler manufacturers recommend an annual service. 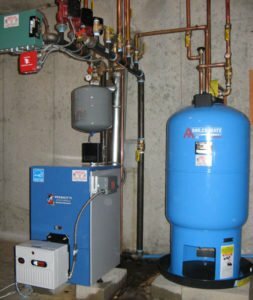 What are the benefits of having an oil boiler service? Clearing the sooting. As the boiler operates there is a build up of soot from the oil burning. This soot reduces the efficiency of your boiler thus costing you more money in oil to heat your premises. The sort over a period of time ca cause harm to your boiler and the parts therefore reducing the lifespan. Checking your emissions are safe. As the oil is burned through the burner CO2 is released. We check they are at safe levels and that that are escaping safely through the flue (no blockages) and that the flue itself is structurally sound. Checking for worn parts. We can give you a very good idea of the overall health of your boiler. This is most relevant in cases of leaking pipes. Total optimization of performance and start up. If you start hearing strange noises it's time for an oil boiler service. Boilers can be compared to cars, if you didn't have a service for years it still may run. On the other side the chances are you will have excessive fuel consumption, reliability and safety issues. Why choose us for your oil boiler service? With over 30 years successful trading we are a large well established company. Our client portfolio consists of some large property management companies, social housing, the four courts and a leading insurance provider. Polite and courteous staff. Our staff have between 10 and 33 years in the plumbing trade and are extremely reliable as well as experienced. This complete depends on the type and make of oil boiler you have. The price will be between €60 -€90 including V.A.T. at 13.5%. This even at the high compares favorably to some of our competitors who charge €99.